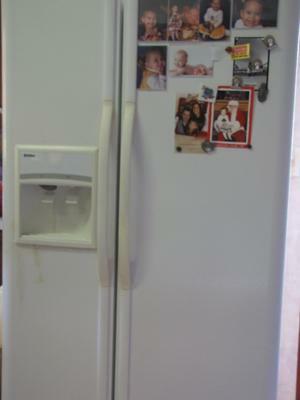 I bought this Kenmore side by side refrigerator in 2002 from Sears (side by side with ice & water in the door) and within one year of it's life I had problems. I hate it so much I wish I could just pick it up and throw it. When it makes ice the ice falls in back of the tray and not in the tray. That leaves the ice to fall into the bottom shelves of the freezer. Ice maker broke and had to be replaced, but was still under warranty. I was thankful but it did not stop there, ice maker jammed and broke again than water started leaking from under the fridge and still is. I keep a towel right under the front to catch the water and change it daily. I thought I could get it replaced because of the lemon law but that was impossible. I just got tired of paying Sears $300.00 every time they came out so I've patched it up myself and dealt with it. 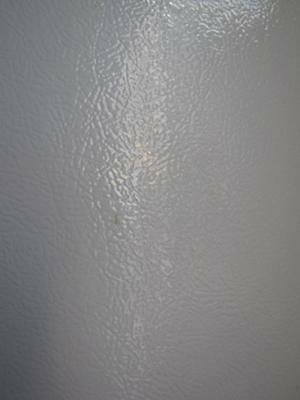 Also, both sides of refrigerator started producing rust spots. I have touched them up with white paint but they kept on coming with no explanation for such a problem. I have my theory, it's a piece of junk, inferior parts, inferior labor and as a result an inferior product. Oh, and 2 of the plastic shelves that hold the veggie draws are duck taped and have been that way for 7 years or so. Now back to the freezer, yesterday I resorted to my blow-dryer trying to thaw the block of ice that has formed in the bottom of the freezer with the food in it. Today I said no more and ran out and bought another refrigerator. I bought one that is made and assembled here in the U.S.A. I just can not take one more piece of junk made in other countries. I will not buy anything from Sears now they are not what they once were. We bought a refrigerator from Sears. The door & the freezer & the inside of refrigerator got all rusted. I will not purchase from Sears anymore. I completely agree with you. I think at this point it is fair to say that all Kenmore appliances are pieces of junk. Especially Kenmore refrigerators. Get this, my vegetables freeze all the time while the upper shelves are too warm. And within two years of buying it, EVERY drawer and door shelf has broken and needed to be taped. I now have a bad habit of looking in other people refrigerators to see how well they've held up. When I don't see any duct tape and feel like I got ripped off.